Schaefer curved base cheek block fits up to 2 inch diameter spar sections for easy mounting. 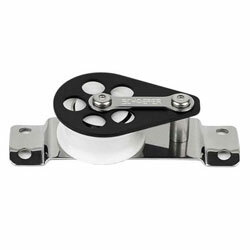 Ideal for control lines on dinghies and small daysailors. Ball bearing sheave provides a low friction lead.